After a very exiting Virginia Regional, we got qualified for the 2015 FIRST Championship, thanks to the Engineering Inspiration Award. We went exploring through the town and visit several monuments and buildings. You can find our day to day photos and videos below. We were assigned in to the Tesla Division, 1 of the 8 FRC divisions, together with 76 other FRC teams. We ended at with ranking 56 out of the 76 teams in our division. But we were honored with the Team Spirit Award sponsored by Chrysler. 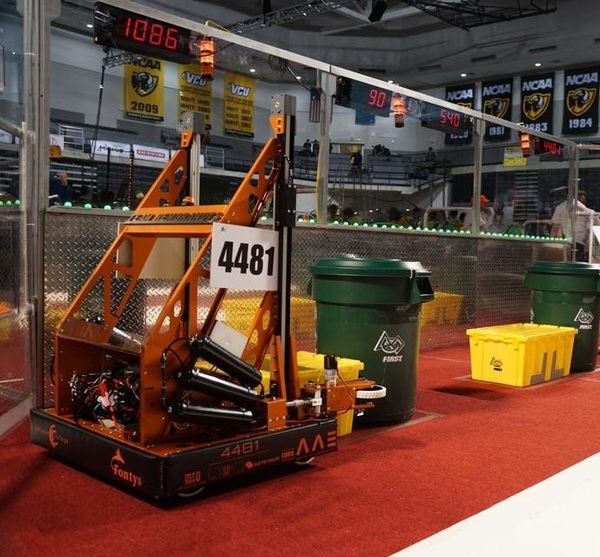 2015 was another wonderful and great FIRST Robotics Competition season. Check our many photos and videos to get a good impression. Here we are again! Arrived in St. Louis throughout the day after we’ve traveled in three different groups. Due to the weather and overbooked flights almost everyone got a little bit delayed. Nevertheless we had a good trip and are really glad to be here! The plan for Tuesday is the Science Museum or the Zoo. For now; enjoy the pictures! After waking up quite early and having some breakfast we’ve visited the dome for a sneak peak. We got to see where the divisions field will be and a bit of the pit area! After our tour we’ve visited the Cardinals stadium and arranged a tour for Tuesday. We’ve had some greasy lunch at Hardee’s and following that, half of the group visited the Zoo and the other half went to the Science Museum. After all we had a great day with lots of fun! We’re going to visit the Arch and City Museum today! (Today = Tuesday) Tomorrow will be practice day. Stay tuneddd! We’ve started the day with visiting the Cardinals baseball stadium for a tour. We had a very experienced guide with us who followed the Cardinals since 1956. Due to his knowledge he learned us a lot and we’ve been on the field, in the duck outs and basically everything except the locker rooms. After the tour we’ve had some lunch and visited our friends from the Netherlands: FLL Telgenborch at the Arch. We’ve went up together and after the tour through the Arch we’ve played some Frisbee Rugby. After all we had an amazing day, good weather, good workout & lot’s of fun! Schedule for Wednesday is: preparing the software, make arrangements for the pit area & getting ready in general for the championship! Then between 14:00 – 20:00 we have our inspections and practice matches! While on our way to the Edward Jones Dome we’ve came along Wizard of Code from Maerlant-Lyceum on their orange bikes. Five of our team representatives were allowed to enter the pit to uncrate the robot and get it up & running for inspections. Around 17:00 the whole team was allowed to enter the dome & they’ve did it in Rembrandts style. (We made sure people knew that Team Rembrandts was in the building :)) After a rough start we’ve still made it in time for our first practice match. After the match we knew what was needed to be changed for tomorrow! We will post our match schedule and a link to the live stream on Thursday morning during breakfast. We hope that we’re able in keeping you all up-to-date during the day. (We suffer from wifi and 3g connection.) Wish us luck for tomorrow! While we were preforming our grand entrance we got filmed from multiple angles and by different crews. From using our breath for singing we switched to blow up all our balloons for pit decorations. Besides that we had a rough start of the day on the field, some minor malfunctions and some tweaking fixed the job though! We’re happy everything got worked out and we did a 3 x 6 stack + 1 x 4 stack in a practice match at the end of the day. Hopefully we can make that last 4 stack into a 6 stack tomorrow in our last 6 qualification matches. Here are the photos from Thursday, enjoy! Boy oh boy, what a day! We had some amazing matches, pulling of 3+ x 6 stacks & beating our personal high score with a 213 point game. Luckily our robot wasn’t the only thing that was doing great; the whole team was preforming amazingly! The alarm for Saturday morning had been set at 5:30. Being there in time for the award ceremony and alliance selection. Fingers crossed! We've won the Team Spirit Award!!!! We had such an amazing week with lots and lots of fun. The Team Spirit Award: "Celebrates extraordinary enthusiasm and spirit through exceptional partnership and teamwork furthering the objectives of FIRST." See you in the Netherlands!